Russia is rapidly building an Innovation City near Moscow, a prized new home for investors, scientists and researchers. A 600-hectare business park under construction has five clusters: biotechnology, energy, IT, space and nuclear technology. Russian rock singer-songwriter Boris Grebenshchikov famously sang ‘Halfway between Kalinin and Tver’. Speaking allegorically, it tells the story of Russia's path since the collapse of the Soviet Union and beginning of perestroika. It compares the country to a train travelling from the city of Kalinin (the city’s Soviet name) to Tver (the name it used to have before the Revolution and regained in the 1990s). The 1997 song resonates perfectly with present day reality. Although it has been some time since Gorbachev’s reforms kicked in, some of Russia's industries are still where they were in the late 1980s. The Soviet Union had one of the greatest schools of scientific thought in the world during the days of the planned economy, but with the advent of capitalism, it became non-competitive. A consensus has emerged among Russia's ruling circles that the economy needs to move beyond its dependence on oil and gas exports and science must be put on a capitalist development track. So the Skolkovo Foundation is seen as a locomotive designed to finally drag it from Kalinin to Tver. Lenin wanted to build Communism in a particular country and we want to build the country’s high-tech future in a particular city, so goes the refrain at the Skolkovo Centre. The city – dubbed innotown or innovation city – is set to be completed by 2014. Located just outside the Moscow Ring Road (MKAD), the city will feature a state-of-the-art transport system and infrastructure. It will be home to 15,000 people: scientists, researchers, businessmen and their families. The project has been developed in collaboration with global landscape design masters such as French architect Michel Desvigne to lure promising young scientific startups. Living conditions are, however, certainly not Skolkovo’s only way to attract investment projects. Companies participating in the project will get considerable customs and tax benefits. At this point, it already has 200 members and the figure is likely to reach 250 companies by the end of the year. Similarly, by year-end, the Foundation will have spent over 1 billion roubles to fund 30 startups. All in all, Skolkovo has already invested 4.7 billion roubles in 40 startups. Yet one should not get one’s hopes too high and expect to receive everything immediately. First, a company has to pass through a selection process and prove that it deserves the funding. The future innovation city boasts five technology clusters: IT, nuclear, space, energy and biomedicine. Within this framework, the Foundation’s authors are planning to build a huge international research network that should be of equal interest to investors and scientists. Skolkovo has signed agreements with such giants as Boeing, Intel, Cisco, Nokia, IBM, GE, Siemens and many others. The centre’s weakest point so far is financing. Up till now, it has been funded almost entirely by the government. Some experts are cynical. “How can they speculate on building a competitive environment in Skolkovo while living off the state?” wonders Mikhail Emelyanov, vice chairman of the Fair Russia faction in the State Duma. The powers-that-be driving the Foundation are, however, optimistic, as anyone attempting to create technocracy within the confines of a particular city should be. “It is customary to castigate all government initiatives in Russia and nothing could be more pleasant than to lash out against what appears to be a very controversial project,” says Skolkovo Foundation Vice President Stanislav Naumov. He, is, however positive that the government will cut its share in the project down to 50% and subsequently withdraw from it altogether. There is hope. Portfolio investments in the project have already reached $234 million, with global giants like Siemens, Boeing, EADS, Intel, Nokia, General Electric and IBM already among its business partners. Furthermore, the Foundation is quite familiar with market laws: you have to get investors interested or you will not sell your product. The opportunity to create startups will also help entice investors. In fact, Skolkovo and the Massachusetts Institute of Technology have signed an agreement to set up a joint Skolkovo Science and Technology Institute. The institute’s founders predict it will be the first educational institution in the world that can handle business and innovative activities alongside training programmes and scientific research. Students will receive guidance here from 200 lecturers and 300 research fellows, including foreigners. Scientists from MIT, Harvard and Stanford Universities and other globally renowned institutions will be invited to deliver lectures. 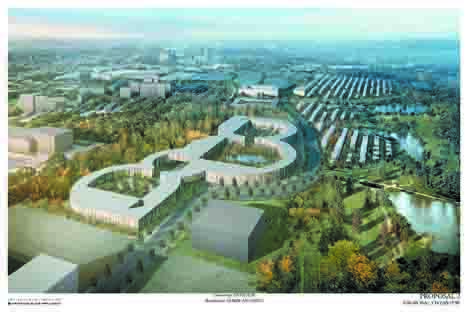 Will Skolkovo, a brainchild of President Dmitry Medvedev, survive the change in the regime? Political scientist Nikolai Zlobin dubs the innovation city as Medvedev’s personal ambition and doubts that the project will be of any consequence to Vladimir Putin, who will almost definitely be the next president. Naumov disagrees and feels the project is above personal idiosyncrasies of politicians. “The project’s future does not hinge on any possible reshuffles within the government,” he says. Skolkovo has invested 4.7 billion roubles in 40 start-ups. 250 companies to set up shop.